Silver Buff Stone Extends More Than a Century of Architectural Context at the School. The Patrick G. and Shirley W. Ryan Center for the Musical Arts, Northwestern University. This type of stone has been used here since the late 19th century. 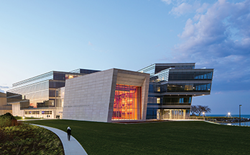 Among recent additions to distinguished campus architecture at Northwestern University, Evanston, Ill., is a building of highest contemporary design, incorporating materials that recall the school’s earliest days. Situated on the shore of Lake Michigan, the music center houses teaching studios as well as faculty and administrative offices. It includes 10 classrooms, 99 practice rooms, and three state-of-the-art performance spaces distinguished by exceptional acoustics – the 400-seat Mary B. Galvin Recital Hall, the Shirley Welsh Ryan Opera Theater, and the David and Carol McClintock Choral and Recital Room. The center’s limestone base design supports a mainly glass exterior, offering striking views of Lake Michigan and the Chicago skyline. Integrating ideally with the architectural context of the Northwestern campus is the Silver Buff stone variety from Indiana Limestone. A mostly smooth surface with some rustication was provided for most of the stone. Some panels were provided with combing to dress their surfaces. Galassi Stone & Steel, Romeoville, Ill., fabricated the project stone. The mason was Illinois Masonry Corp. of Buffalo Grove, Ill.; general contractor was Power Construction, Chicago.